EVstudio participated in Milender White’s golf charity event at Fox Hollow Golf Club. We are happy to be a part of a charity that raised over $30,000 for various children charities. Unfortunately, our team of Greg Arbour with KLG, Carl Boone and Justin Boone with CandL Development and Jim Houlette with EVstudio came in last place and earned the ‘OOPS’ prize. But we had a great time and we look forward to next year! EVstudio’s Apparel Store now includes baseball caps in a variety of styles and colors. Show your EVstudio style on your head. 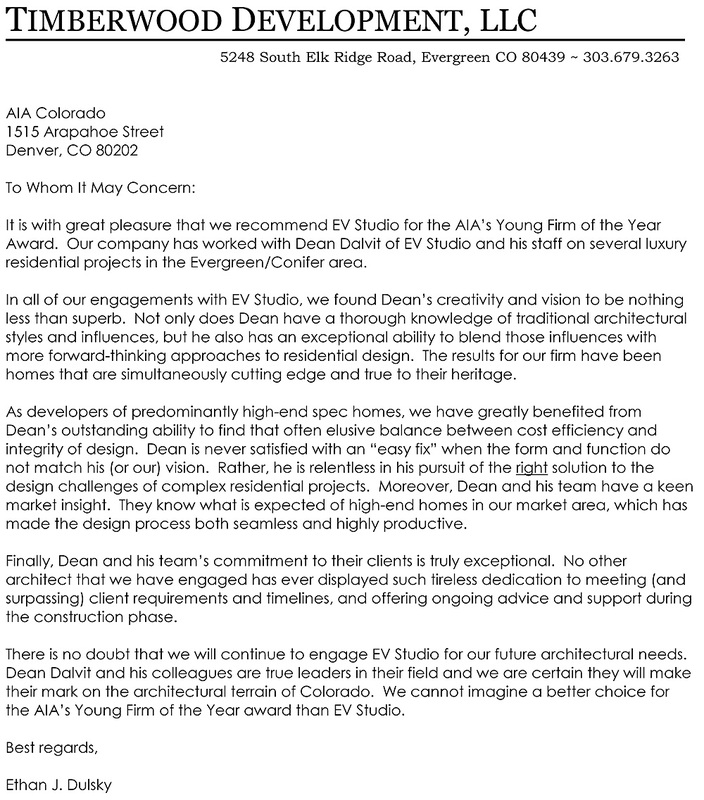 We submitted for an AIA Colorado award and one of our great clients, Ethan Dulsky, wrote us a letter of recommendation. Timberwood Development’s recent project really turned out well. As a compliment to the longer blog posts that I write for EVstudio.info, there is now additional content on my twitter feed. Subscribe to the feed for quick information on the latest and greatest. You’ll see updates on new and continuing projects, observations on architecture in everyday life, links to our contacts and maybe a great deal or two. The feed is also locate on the bottom of the right hand column at EVstudio.info. Gene, what position do you hold at EVstudio? I am currently one of the three Principals of EVstudio. I manage our Texas office, am responsible for business development in the Texas and Southwest markets, and am the bartender at our EVstudio Christmas party. As an architect, I am tasked with all the responsibilities that go along with that title the same as would be expected in most any other office. As a business owner, I am tasked with everything the architect doesn’t do! I enjoy the demands and challenges that running a business offers and could not imagine operating in any other capacity. I also consider myself a mentor, teacher, partner, leader, and friend. Although those aren’t official titles, I place a great deal of emphasis on their importance in the growth and health of our business. How did you end up in Texas? I didn’t really end up in Texas. I grew up in Texas. I met my wife in Texas. Most of our immediate family is in Texas. I like to think of it as getting back to Texas. After spending over 10 years in Colorado, there is no way I would be in Texas right now if I did not have such strong roots here to begin with. Except for the 7 months of mind melting heat, it really isn’t that bad here. How did you become an architect? The hard way! I’m serious. When you hear someone refer to the path least traveled they are actually referring to my journey towards becoming an architect. I started out by earning an Associates Degree in Drafting and Design from Central Texas College. I worked as a draftsman in an architect’s office in Houston and soon fell in love with architecture. I quickly worked my way up to CAD Manager and shortly thereafter I became a Project Manager. By then I accepted the fact that I had missed my opportunity to attend a university that offered an architectural program and pursue becoming an architect. After becoming less and less enchanted with Houston, my wife and I were ready for a change of scenery. Where is there better scenery than in Colorado? I accepted a position as Project Manager for a small architectural firm in Ft. Collins, Colorado. Because it was a small firm, I learned more than I ever imagined I could. I spent a great deal of time in the field as well as in the office. Most importantly, I learned what being an architect was really all about. While working in this small office I discovered that Colorado was one of the last remaining states in the country that would recognize education other than a degree in architecture when applying for licensure through examination. I enrolled in the Internship Development Program through the National Council of Architectural Registration Boards and started what turned out to be a 7 year internship. I eventually qualified to take the 9 registration exams that all architects in the US and Canada must take to become licensed. I passed all 9 exams and received my license to practice architecture in Colorado. The Texas Board of Architectural Examiners was kind enough to recognize all my efforts and granted me a license to practice in Texas. I would not recommend, no, I would highly discourage, this path towards becoming an architect to anyone that asks…but it worked for me. I value the experience I gained along the way and believe that those experiences give me a different perspective towards architecture. What do you enjoy most about being an architect? The right answer probably has something to do with creativity and the phenomena of watching one of your ideas become a reality. My answer, though, is “EVERYTHING”. I still smile sometimes when I realize I am one of the few people that are fortunate enough to be doing what they love to do. I thrive on the long hours and the challenges. I enjoy working with our clients and interacting with our staff. I also appreciate the sense of accomplishment I get at the end of a project when I reflect on what it took to get there. I can’t imagine doing anything else. Actually, I don’t know how to do anything else. My wife, Kelley, and I have been married 18 years, or almost 19, as I often say. 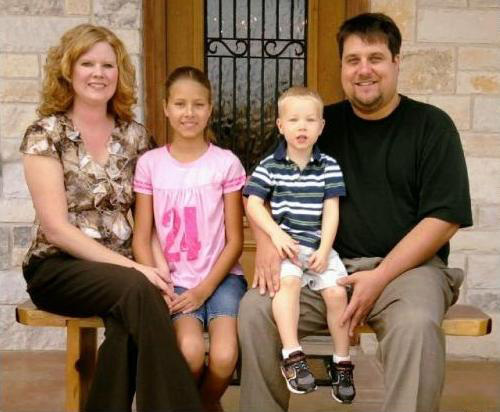 Our daughter, Kelsey, is 10 and our son, Ryan, is 2 (and a half). We just recently lost our Golden Retriever, Harley, after almost 14 years. I have been blessed with a wife that understands me and supports me. I wouldn’t be where I am today if I did not have her with me. She wouldn’t be where she is today if she wasn’t with me…and she reminds me of that more often than I think is really necessary, but I like to think she means that in a good way. Anyone that knows me already knows the answer to that question. I am sure that most of us have seen the bumper sticker that says,” Don’t take yourself too seriously…no one else does”. I believe in that as much as Luke believes in The Force. I have learned the hard way (are you seeing a pattern here) that most of the stress that we have in our lives is self induced and unnecessary. I believe that a person can be professional, successful, and a valued asset to their industry without being a “stuffed shirt”. Work hard, stay true to your principles, trust in God and Family, and the rest tends to take care of itself. WHAT POSITION DO YOU CURRENTLY HOLD AT EVSTUDIO? I have been a Project Designer with EVstudio since April 2008. I am involved in nearly every project phase including: client programming meetings, schematic design, construction documents, structural design, and construction administration. I work on a variety of projects from beginning to end and do my best to ensure the process goes smoothly and the client is happy. WHAT ARE SOME RECENT PROJECTS THAT YOU’VE WORKED ON AND WHAT IS YOUR FAVORITE PROJECT TYPE? I have been involved in a number of projects since starting at EVstudio, some including: the Gardner, Pierce, Andrews, Rigo & Patel Residences, Rawley Wash Park Remodel, a few Honka Log homes, multiple remodels at the University of Denver, various tenant finish projects at Bergen Village, remodel for Pink Fog Photography Studio, Retail/Medical Office Building in Killeen Texas, and the Lagos Market Remodel. Although I also enjoy commercial projects, my favorite project type to work on is residential simply because it’s fun for me. I’ve been interested in the design of homes since before I knew I wanted to be an architect. I like creating spaces and residential design offers the ability to create space on a more personal level. I really enjoyed working on the remodel we did for the Rawley’s in Wash Park. It’s fascinating to see the original structure and how homes used to be constructed. I also enjoy envisioning the potential an old house has to becoming something great. WHAT UNIVERSITIES DID YOU ATTEND? I graduated from CU-Boulder in 2006 with a Bachelor Degree in Environmental Design. I then enrolled in the Master’s program at CU-Denver and received my Master’s of Architecture in December of 2007. WHERE WAS YOUR MOST MEMORABLE TRIP? My most memorable trip was studying a semester in Italy in the Fall of 2005. I studied in both Florence and Rome, Florence being my favorite. I studied Beginning Italian, Italian Art & Architecture History, and took an advanced Design Studio. While in Italy I also visited Pisa, Livorno, Siena, Rimini, Venice, Vicenza, and Orvieto. I will never forget the amazing experience and look forward to visiting again. WHAT WAS YOUR FAVORITE JOB (BESIDES EVSTUDIO)? My favorite job, besides EVstudio, would have to be as a barista at Gelato d’Italia in Cherry Creek North. My favorite part was the free gelato and the long summer lines out the door. I was born in Arlington, VA and lived there until I was 5, until my parents’ job brought us to Denver. I still consider Denver my hometown. Since I was young I was always involved in different sports from soccer and basketball to gymnastics, ballet, and kick-boxing, but my favorite sport to play is definitely fast-pitch softball. I love pitching and playing first base. ARCHITECT YOU’D LIKE TO MEET (INCLUDING DECEASED)? Antoni Gaudi- I visited some of his buildings in Barcelona and would’ve liked to ask him about the concepts behind his unusual designs. I am involved with the AIA Denver Housing Committee where I helped plan the second annual How to Work with an Architect event for Architecture Month 2009. I also volunteer on a continuous basis for different outreach programs through my church as well as other charitable organizations. WHAT DO YOU FIND YOURSELF DOING WHEN YOU’RE NOT WORKING? I enjoy anything having to do with the outdoors and water; swimming, jet-skiing, hiking, basketball, softball, fast-pitching, batting cages, city biking, walking the dog, happy hour with friends, coffee shops, bargain shopping, cooking, jogging at Wash Park, spending time with family, trying new restaurants, picnicking, and of course traveling. You are currently browsing the archives for the About EVS category.